Kevit Payroll Management is a comprehensive enterprise-grade payroll software with a rich feature set and tons of benefits. It has an auto-fill capability designed to streamline and speed up repetitive processes including attendance, payroll, and employer contributions. Predefined workflows help get things started and promise accurate processing of employee salary, statutory deductions, and contributions. With Kevit Payroll Management software, companies and organizations can define their own earnings and units based on their requirements. The software also comes with employee information management tools to help them closely track employees and ensure that their salary is processed accurately according to the salary structure assigned to them. Other features include loan and advanced management, reimbursement management and bank transfer details, arrears calculation, and tax reports among others. Kevit Payroll Management software is equipped with a very user-friendly interface that is easy to familiarize. A short learning curve may be required before you can get fully acquainted with the software but after that, you are good to go. You can also customize the software to suit your needs, existing workflows, and processes and easily scale up as your requirements change. Kevit Payroll Software helps you save time by automating many repetitive and time-consuming tasks while ensuring the accuracy of all payroll-related calculations. Simply put, it makes payroll a whole lot simpler and quicker yet without the errors that usually come with manual processing. The same goes for tax processing and other financial records. Kevit Payroll Management software takes care of all your tax-related tasks by computing the data and generating tax statements and other reports automatically. By automating many of payroll processes, the software effectively eliminates the stress of processing all the records. Kevit Payroll Management Software greatly contributes to the reduction of the TCO while boosting your company’s ROI significantly. Kevit Payroll Management Software is designed to track and maintain all the information of salary transfer. This greatly helps with auditing, information validation, and more. What Problems Will Kevit Payroll Solve? Many organizations don’t have a system in place to track the exact location of their employees. Kevit Payroll Management Software has capabilities that help them accurately locate their employees. Since each enterprise has unique business needs, it is prudent for them to abstain from seeking a one-size-fits-all perfect software application. Needless to say, it would be useless to try to find such a system even among popular software solutions. The clever thing to do would be to list the various important elements that require consideration such as required features, budget, skill levels of workers, company size etc. Then, you should do your homework thoroughly. Read some Kevit Payroll reviews and look into each of the other apps in your shortlist in detail. Such exhaustive research can ensure you weed out ill-fitting platforms and select the system that presents all the elements you require for business success. How Much Does Kevit Payroll Cost? We realize that when you make a decision to buy Payroll Software it’s important not only to see how experts evaluate it in their reviews, but also to find out if the real people and companies that buy it are actually satisfied with the product. That’s why we’ve created our behavior-based Customer Satisfaction Algorithm™ that gathers customer reviews, comments and Kevit Payroll reviews across a wide range of social media sites. The data is then presented in an easy to digest form showing how many people had positive and negative experience with Kevit Payroll. With that information at hand you should be equipped to make an informed buying decision that you won’t regret. 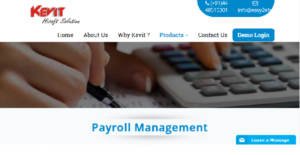 What are Kevit Payroll pricing details? What integrations are available for Kevit Payroll? If you need more information about Kevit Payroll or you simply have a question let us know what you need and we’ll forward your request directly to the vendor.